Lost Lit is thrilled to team up with Land of Gazillion Adoptees to bring you a unique spin on discussing adoption and its many shades of grey. 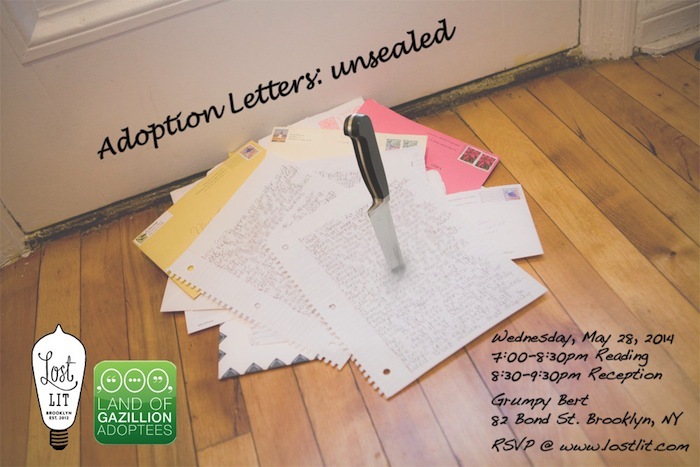 Featured guests intimately invested in the adoption community will use the letter format to express their point of view. It’s our hope that with the co-mingling of these diverse voices, a new/different perspective about adoption will emerge for all attendees. Featuring: David Amarel, Martha Crawford, Lynne Connor, Kathryn Joyce, Joy Lieberthal, James Lane, Andy Marra and John Sanvidge. 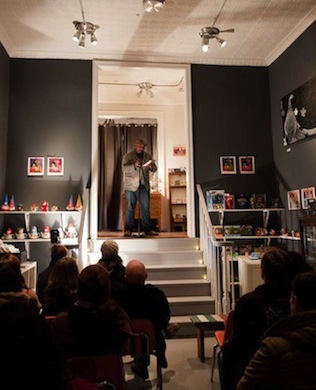 Kevin Vollmers, the mastermind behind Land of Gazillion Adoptees, will emcee the night. BUT THAT’S NOT ALL! We want the audience to be fully engaged and involved in this discussion. After the presentations, there will be time for everyone to write their own letter to someone or a group of people and then have the chance to read their letter aloud. Since the act of writing and reading your thoughts aloud on such a loaded topic (adoption) can be intimidating, paralyzing even, we invite audience members to write their letters at home (yeah like HW), bring them in and then volunteer to read the letter aloud. OR, there will be an option to place letters in a real time mail box to be read aloud by one of the presenters. *How you found out about this event. Seat not guaranteed until confirmation email received. DAVID AMAREL is a clinical psychologist in private practice in New York City. David has received over ten years immersive training in adoptive parenting from Eli (In Beom) and Lucy (Sunghee). Along with his wife, Martha Crawford, the family of four resides in Brooklyn Heights. David and Martha are columnists for Gazillion Voices magazine as well as co-founders of SubText Consultation, a clinic and consultation service for writers. LYNNE CONNOR, a Korean adoptee transplant from New Jersey, calls herself a writer. She received her M.F.A. in creative writing from Mills College and has been published in the Asian American literary journal, Kartika Review, as well as Adoption Today Magazine. Currently, Lynne has a love hate relationship with her memoir ABANDON ME and hopes to return to her YA fiction manuscript that’s been patiently waiting for attention. In the meantime, Lynne is a certified Amherst Writers & Artists affiliate leading creative writing workshops through Lost Lit. She resides in Brooklyn, NY with her husband, Grumpy Bert and furry son Remy-the-Pug. MARTHA CRAWFORD is a psychotherapist, with a generalist private practice in NYC for the past 20 years, and writing coach. She is an adoptive parent to two children born in Korea. She and her husband David with the help of several other committed adoptive parents and adult adoptees, founded All Together Now – an adoptee-centered support group for adopted children and their families. Martha and David are adoptive parent columnists at Gazillion Voices magazine and she is author of the blog What A Shrink Thinks. KATHRYN JOYCE is a journalist and author of The Child Catchers: Rescue, Trafficking and the New Gospel of Adoption and Quiverfull: Inside the Christian Patriarchy Movement. Her work has appeared in The New York Times, Slate, The Nation, The American Prospect, Mother Jones, The Atlantic and many other publications. JAMES LANE is a late discovery adoptee, internet media professional, political activist and heavy metal bassist. His current titles include: Adoption Survival Coach, Healing House Publishing ; VP of Client Solutions, Xaxis; Founder, Hot Indie Media; Editor-in-Chief, Hot Indie News; Music Director, M3 Radio; State Committee Member, Green Party of New York; National Diversity Committee Member, Green Party of the United States; Founder, Green Party Adoption Reform; Bassist, Black Dawn. James learned about his adoption at the age of 23 after both of his parents had died within months of each other, but due to laws preventing access to original birth certificates for adoptees it took him 25 years to find his mother last year. He is now using the energy of his reunion to fight for adoption reform so nobody else experiences the trauma that he and his mother had to experience for 48 years. JOY LIEBERTHAL is a social worker and private clinician in New York. She works primarily with kids and young adults who are adopted. She is also a counselor at The Juilliard School in Manhattan. Joy is adopted from South Korea. She has been in reunion with her birthmother since 1994. She is the author of the blog Adoption Echoes. KEVIN HAEBEOM VOLLMERS is the founder of Land of Gazillion Adoptees, LLC (LGA), a multimedia company based out of Minneapolis, MN. He is also the co-editor of Gazillion Voices magazine, and the publisher of: Parenting As Adoptees; The Declassified Adoptee: Essays of an Adoption Activist; Lost Daughters: Writing Adoption From a Place of Empowerment and Peace; and Hank Aaron’s Daughter. Much of his work focuses on the intersectionality between adoption, race, culture, identity, performance, art, politics, and social movement. He has been featured in The New York Times, National Public Radio, Minnesota Public Radio, CNN, Colorlines, Racialicious, Hyphen, and the Daily Beast. Kevin lives in Minneapolis with his two kids.